58 || P R I N T W E A R M A R C H 2 0 1 8 In Search of the Right Mesh I know I have opened more than one mesh specification sheet and been so impressed with the scope of the information and the "transparency" (to use the currently-PC expression) of the mesh-weavers. I adore the mas- sive amount of data and the level of detail on each product, but the problem I have had in the past is trying to predict what this abundance of numeric attributes means to quality and productivity. Sometimes the selection process is sim- ple. For example, if we need to print a 65 lpi halftone and want to hold a long tonal range and print all colors at 22.5-degrees, we would want to use a 315/30 L-grade mesh between 20 and 30 N/cm². 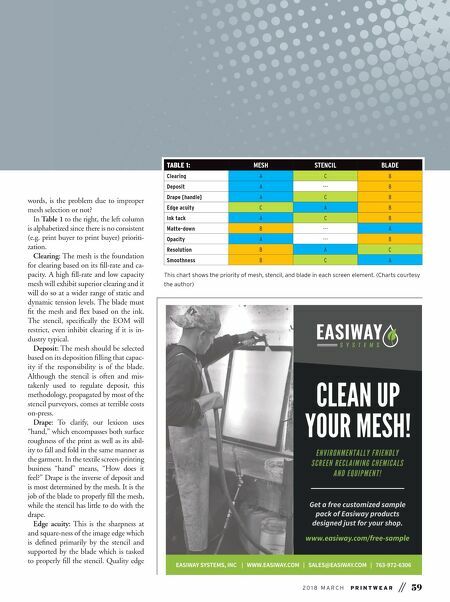 Alter- natively, if we want a beautiful white solid area we might opt for a delicate 100/55 but our example is the toughest one in the mesh selection process, so the mesh will need to accommodate both large area sol- ids and delicate full-range halftones with white ink. The selection process comes when we need to print white ink since the mesh is fundamental in order to balance throughput and quality. WHO'S ON FIRST? If you have read this far, you may wonder if you have a problem, and, if so, if there is a "mesh-solution" in your near future. Abraham Maslow, creator of the Maslow hierarchy of needs, said, "If all you have is a hammer, the whole world looks like nails." The first step in the investigation is to determine the primary and second- ary causes of your specific issue. In other B Y J O E C L A R K E Joe Clarke has spent the past 45 years in the lab and engineering de- partment in prepress and on-press as a research and development and technical researcher as well as a man- ager of screen-print production. He has received a number of print-related patents and is a member of The Academy of Screen and Digital Printing Technologies and a Specialty Graphic Imaging Associa- tion fellow. Clarke has presented hundreds of papers, written a couple books, and published more than 600 technical and man- agement articles for which he has earned numerous industry awards. Currently, he is president of Clarke Product Renovation, a Chicago-based corporation that brings product and process technology to the screen printing industry. 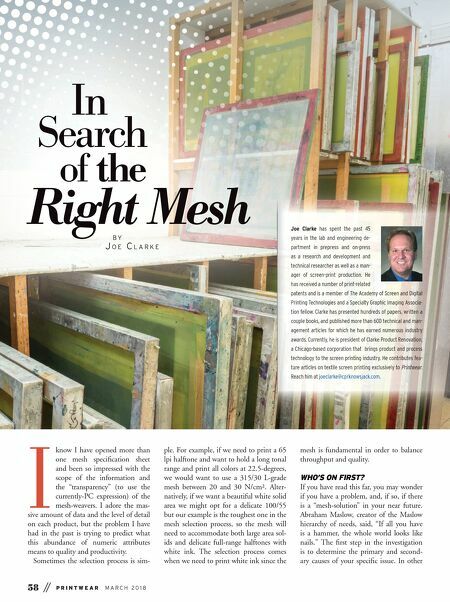 He contributes fea- ture articles on textile screen printing exclusively to Printwear. Reach him at joeclarke@cprknowsjack.com.